After berthing their ship close to the Veracruz coast, Fernando Cortez and his 600 men squadron headed towards Tenochtitlan, King Moctezuma's city. When the latter saw Cortez, he mistook him for his people's Priest-King, Quetzacoatl. Had Moctezuma not made this mistake, the Tenochtitlan warriors would have droven the Spanish invadors out in the blink of an eye. 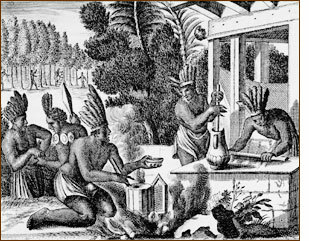 As a welcoming gift, Cortez is offered a beverage called "Tchocolatl", what would call a vanilla flavoured hot cocoa today. As expected, the Spaniards instantly fell in love with the Cocoa and Vanilla flavours they just discovered. Charles V, Holy Roman Emperor, was the first European King to ever try this Vanilla infused beverage. Europeans were instantly interested in these new flavours, aromas, and tastes. Vanilla made its debut in the kitchen right at the beginning of the 17th century. The Totonacs had had the presence of mind not to reveal the Vanilla plant's secrets and european botanists couldn't understand why the orchids they were given wouldn't flower on French Overseas Territories soil. Mexico kept the monopoly on Vanilla production for two centuries after Cortez discovered its very existence. 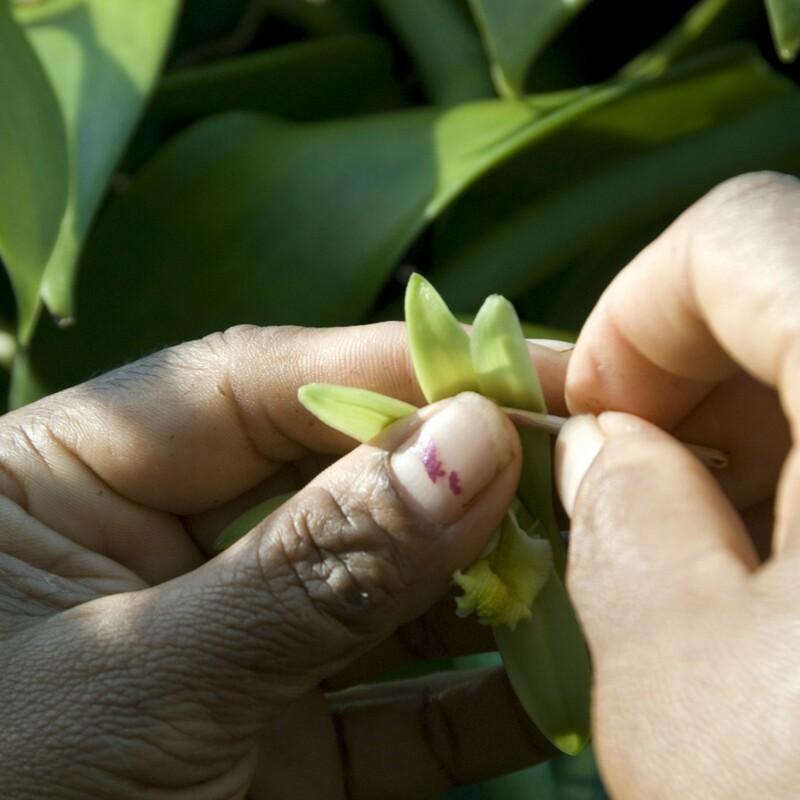 In the 1700's, you could find Vanilla plants in Guadeloupe, Martinique and French Guyana. Pompona variety and other derived from Fragans variety could even be found way before the settlers implanted thousand and thousands of cuttings. You could also find numerous aromatic varieties in the Wayampis tribes' area. They used them to create garlands. Pierre-Henri Philibert, who came from the Reunion Island and was a French officer, brought back to his island thousands of varieties with the help of the Cayenne Governor. These varieties come from Guyana but also from the numerous countries he sailed in on his way home. He also brought back Filipino plants (actually form the Calabarzon region) during another trip. David Floris brought back many cuttings, taken from the greenhosues of the King's garden operator. Once he came back to his homeland, he became a Vanilla producer and dedicated his whole life to this spice. We owe him the improvement of Vanilla production. As of today, his descendants keep this savoir-faire alive on the Reunion island, his homeland. In Mexico, the Melipona bees naturally take care of pollinising the Vanilla plants' flowers. Sadly, there aren't any on the Bourbon Island but hummingbirds can sometimes help with the pollination. But Edmond Albius, a 12 year old boy, was the one that found how to pollinise Vanilla flowers manually, back in 1841. Thanks to his discovery, Vanilla production finally happened on the Reunion Island. His technique is still today the only sure way to pollinate a Vanilla flower. 8 to 10 months after being pollinated, every flower will produce a Vanilla bean. Once Ernest Loupy, Reunion based Vanilla producer, invented the scalding method, Vanilla producing increased. This method is simple but effective. It requires you to throw your green but fully ripened Vanilla beans in a bath of hot water (60° to 75°C/140° to 167°F) for 3 minutes. Its main effect is to "kill" the bean as the professionals say. It actually stops the enzymatic development of the bean. The beans are then rolled in hessian and sterilised. It keeps them warm and helps them get rid of most of the water they contain. The beans are then alternately exposed in the sun on hessian and cool down on grids in the shadow. It gives them their aromatic intensity. The rich soils and high temepratures of Madagascar and Reunion are the perfect combiantion for Vanilla production. Saint-Philippe and Saint-Suzanne are the most known Vanilla producing regions of Reunion. Their volcanic soils are nutrients-filled, which makes them a great base for Vanilla plants. The first cuttings and first maturing processes arrived in Madagascar in 1870. The SAVA region (Sambava-Andapa-Vohémar-Anatalaha) is the most known Vanilla producing region of Madagascar. Little known fact, Andapa and its area is the most prolific out of the four vanilla producing regions. Breath-taking Vanilla beans are produced in this steep-sided area. Today, 80% of the world production is Madagascan Bourbon Vanilla beans.